Wherever in the world you may be, you are now most welcome as our honoured guest to visit our Club House in "Virtual Reality". The photos below will take you on a picture tour of The Sindhi Club. 1) View of the Sindhi Club as you enter the premises. 2) The famous Name Board which is ever so welcoming to its "members" ! 3) The Entrance through a "Fish Eye" view. 4) The rear view of the "Sindhi Club" pictured from the car park. 5) Wide angle view of the rear of the building (showing its green lawns). 6) The huge carpark neighbouring the mighty "Indian Ocean" viewed from the Temple. 7) Close up of Car Park, showing its boundary wall painted with arts by our sindhi children. 8) A section of the Stage in the Old Hall , which is also now fully refurbished an centrally airconditioned. 1) View of the Banquets Hall with "The Bar" in background. 2) Another view of the Banquets Hall, showing off its modern Lighting Systems. 3) A picture of the Banquets Hall. 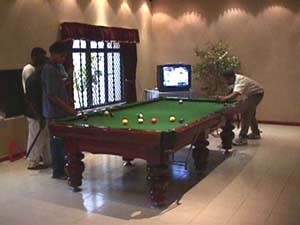 In May 1998, Mr & Mrs Janak Hirdaramani (M/s Hirdaramani Industries Ltd, Colombo), donated a High Quality Pool Table for the proposed Indoor Sports & Recreation Facility. The Pool Table has brought new life to the Bar Area drawing many members in the evenings for a drink and relaxation by "shooting some pool". Here are some pictures of our youngsters enjoying themselves in a game of pool on a Snday afternoon while they keep up with Cricket scores on the TV, in the background. We hope that someday you will visit Sri Lanka and take some time off to visit the Sindhi Club and probably have a meal with us. If you are browsing on this page, and would like to make arrangements for some tasty Sindhi Food Catering or perhaps like to make a reservation of the "Function Room" at the Sindhi Club, its no problem. "SINDHI CLUB INTERNET BANQUETS RESERVATION BUTTON"
This website has been Created by Vinod Moolchand 375, Galle Road, Colombo 3, Sri Lanka Tel: 94-1-575265 Fax: 94-1-575266 Email: vinodm@slt.lk MY HEARTIEST THANKS TO MUDHI & "INFOLANKA" for All the Support and Guidance.